Mark Roberge, Chief Revenue Officer of the Hubspot Sales Division, is one of the best SaaS sales leaders in the world. As one of Hubspot’s first employees, he helped grow the company to what it is today. 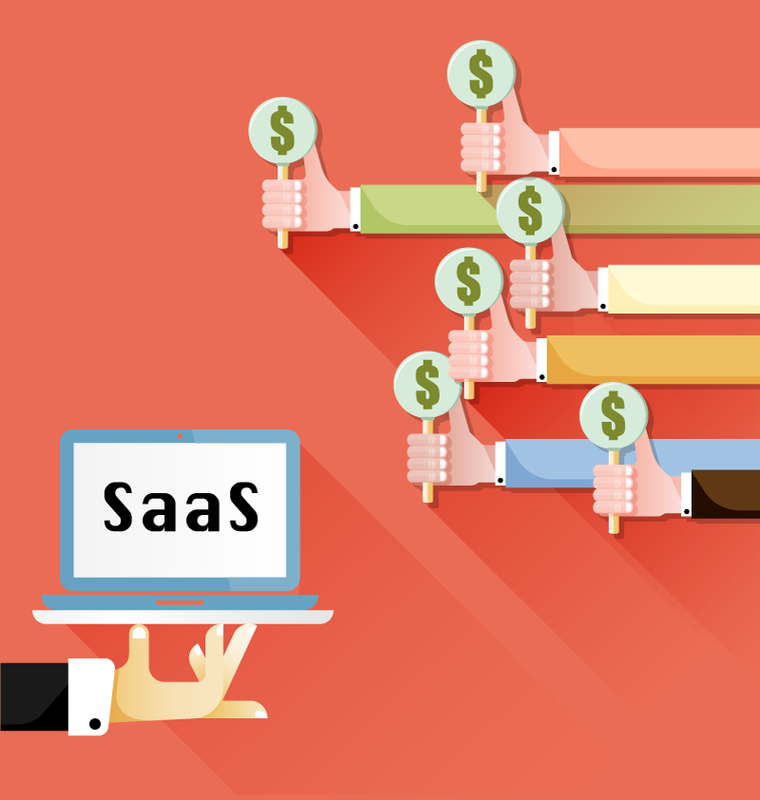 Here are some impressive stats that highlight this SaaS company’s rapid growth. 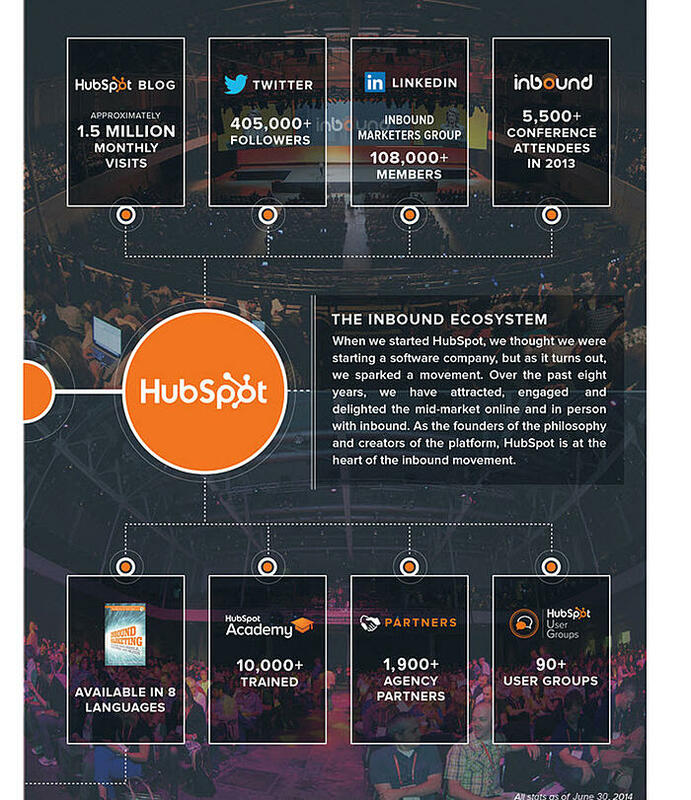 HubSpot’s total revenue increased from $28.6 million in 2011, to $51.6 million in 2012 and to $77.6 million in 2013, representing a year-over-year increase of 81% in 2012 and 50% in 2013. The total revenue increased from $35.1 million for the six months ending June 30, 2013 to $51.3 million for the six months ending June 30, 2014, representing a period-over-period increase of 46%. As of June 30, 2014, HubSpot had 11,624 customers, and in the second quarter of 2014, their average subscription revenue per customer (on an annualized basis) was $8,823. Hire the same type of salesperson. 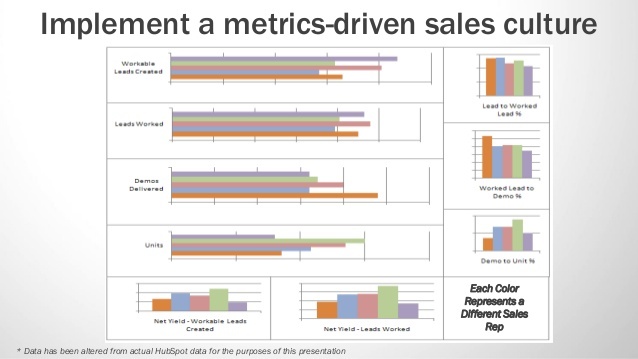 Put them through the same sales training, so you have similar output. Provide them with the same quality and quantity of leads. Hold them accountable to the same sales process. 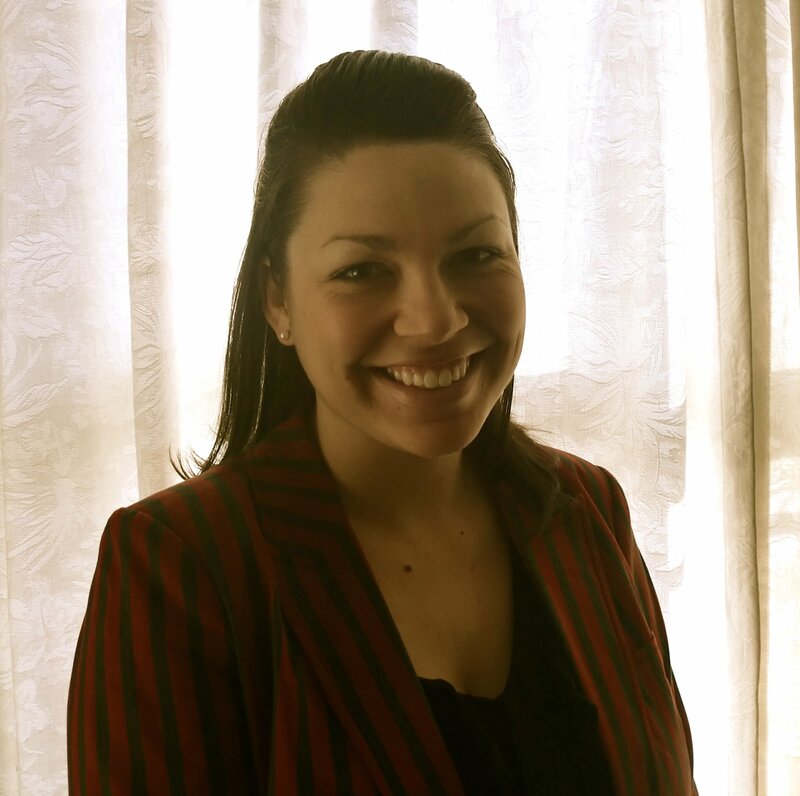 Roberge employed this system in order to create predictable, scalable revenue growth. What follows are his four steps in further detail. How do you hire the right salesperson for your business? Roberge used 10 criteria he believed were essential to a salesperson’s success. 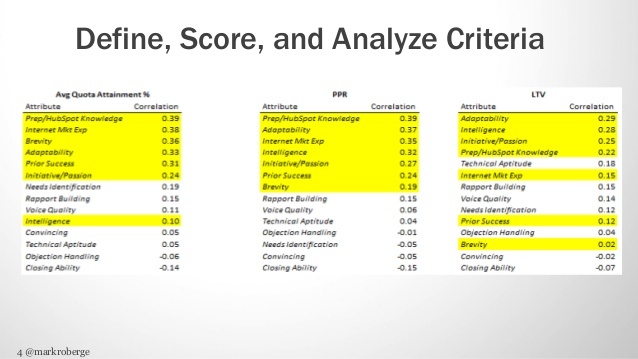 Using a 10-point scoring system, he ranked how important each criteria point was. What correlated with success? Intelligence, success, work ethic, and the big one: coach-ability. From that point on, if an interviewee was able to take constructive criticism and redo a pitch based on Roberge’s coaching points, he knew they were open to being coached and their skills could easily be improved. When it came to the actual hiring process, Roberge created his own recruiting agency within Hubspot. This team uses what they call the “force referral” to land the best candidates. A month or two after someone is hired, the recruitment team sifts through the new hire’s LinkedIn connections looking for people who work in sales, went to good schools and live in Boston (where Hubspot is located). They then ask the new hire about these potential candidates, get feedback on each, and have the new hire introduce the recruiter to the candidate. First and foremost, it’s important to put all salespeople through the same training. At Hubspot, Roberge has created what he calls a “predictable factory,” in which new hires go through classroom-style training for a month, take a 150-question exam, and finally receive Hubspot certification in sales methodology, inbound marketing, and the Hubspot product. Salespeople need to be a trusted adviser, a consultant, and be able to understand the unique pains and challenges of the buyers, and associate them with the marketing message that your company puts out. The more you can put salespeople in the seat of your prospects and feel the pain that they go through, the better chance you’re giving them of becoming a consultant. Lastly, Roberge doesn’t allow the new hire to make sales calls during his or her first three weeks with the company. Instead, they use the Hubspot sales and marketing platforms to better understand the ins and outs of the product. Hubspot is unique in regards to their initial demand generation strategy. Instead of launching their site and product first and then their blog, they switched it. In fact, the Hubspot blog was live nine months before the product. According to Kissmetrics, by the time they launched, they already had 700 subscribers to the blog. Talk about stirring up demand! This is how Hubspot did it: they hired a 20-something English major to interview thought leaders in their company and crank out content based on those interviews. The part-time employee created three to five page eBooks, short blog posts with CTAs linking to these eBooks, and tweets promoting the blog posts. This is pretty commonplace now, but was revolutionary back when “inbound marketing” wasn’t a term widely used or well known. This is how Hubspot built up their subscriber list, amassed a social following, created leads and improved their ranking. Genius. Do research on your prospects and learn the ins and outs of their roles at their respective companies. Find out pertinent information like the prospect’s position, department, responsibilities, and to whom s/he reports. How are prospects finding you and where are they coming from? Learn how prospects are engaging with your company: how they heard about you, what pages they’re visiting on your website, if they’re opening your emails, if they’re mentioning you on social media, etc. Leverage lead intelligence and advising. If a prospect just downloaded an eBook, call him or her up and offer him or her additional resources on the subject. Encourage prospects to ask questions and listen to them. This may provide salespeople the opportunity to move the conversation to the prospect’s interest in your product or service, during which you can set up a more formal meeting where you can go over what it can do and how it can solve the prospect’s specific needs. The last key ingredient in holding salespeople accountable to the same sales process is to coach them properly. Once again, Roberge turns to data to do this effectively. 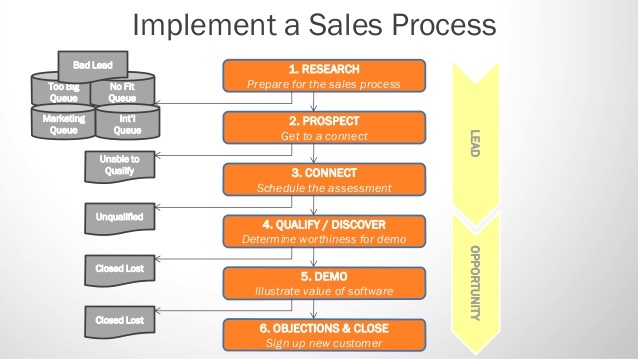 Kissmetrics describes Roberge’s approach as a “funnel for salespeople.” Not only does it show how many leads each salesperson created, it also shows how many leads were worked, how many demos were delivered, and how many deals were closed. By looking at the conversion rates for each step, Roberge is able to isolate where salespeople are struggling and thereby provide the proper coaching. By being consistent and staying true to this process, Roberge has been able to take Hubspot from an unknown SaaS startup to one of the fastest growing companies in a rapidly growing field. Take a tip from this SaaS superstar and create predictable, scalable revenue growth to take your business to the next level.